From a very young age, it’s drilled into us that we need to floss daily to prevent gum disease and cavities. But as a recent investigation by the Associated Press reveals, the benefits of dental floss are largely unproven. [The] government acknowledged the effectiveness of flossing had never been researched, as required. That’s a rather monumental revelation—especially considering how often we’re reminded to floss our teeth—and considering that the global market for dental floss is expected to reach almost $2 billion next year (with half of it in the United States). The two leading professional groups—the American Dental Association and the American Academy of Periodontology, for specialists in gum disease and implants—cited other studies as proof of their claims that flossing prevents buildup of gunk known as plaque, early gum inflammation called gingivitis, and tooth decay. However, most of these studies used outdated methods or tested few people. Some lasted only two weeks, far too brief for a cavity or dental disease to develop. One tested 25 people after only a single use of floss. Such research, like the reviewed studies, focused on warning signs like bleeding and inflammation, barely dealing with gum disease or cavities. Part of the problem, says Aldridge, is that many people don’t floss correctly. Instead of moving it in a sawing back-and-forth motion, we’re supposed to move it up and down the sides of our teeth. 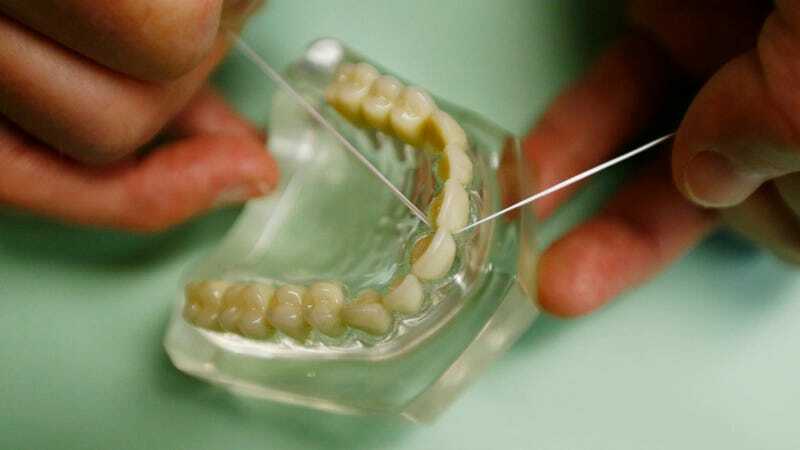 But flossing can also cause harm when it’s done incorrectly or too vigorously, damaging gums, teeth, and dental work. The AP also found that manufacturers of dental floss are struggling to provide convincing evidence (which is hilarious considering they actually fund a lot of this research). Johnson & Johnson told the AP that floss helps remove plaque, but when the company was sent a list of contradicting studies, its spokesperson declined to comment. Similarly, Procter & Gamble claimed that flossing fights plaque and gingivitis, but its “proof” for this claim came from a two-week study that was deemed irrelevant in 2011 during a research review.